My room is beneath the first ‘L’ in Lochalsh and I am sat at the adjacent window, to the front, looking out on the Kyle as I type this post. If this was a postcard, I would scratch “I am here” in BIC biro. Sat at this window on April 24th 1973, I would have seen a dark blue Mitchell Van Hire, 18cwt Bedford CF, board the Skye ferry. 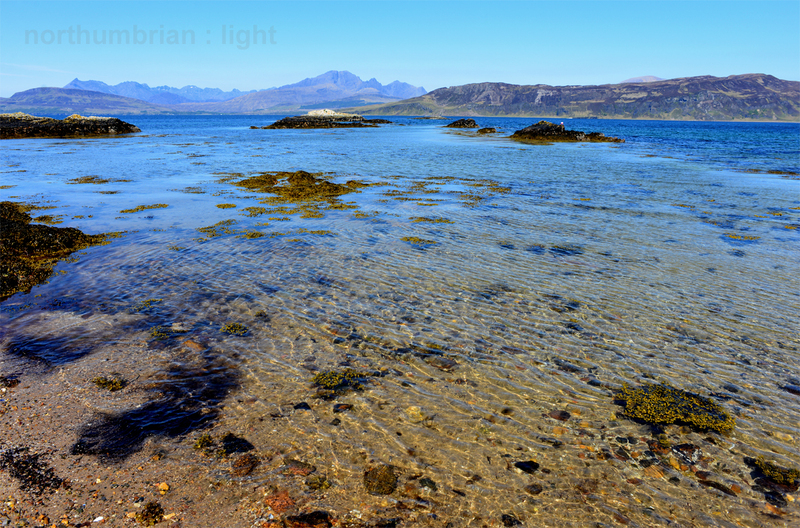 The driver, dressed in a too-long purple jumper knitted by an earlier girlfriend, a pair of too-wide flared jeans, a straw hat and Mexican sandals made from old car tyres, we were heading for Glen Brittle and perfect Spring sunshine. How things have changed. The road now sweeps across the Skye Bridge, I have arrived by train, it is February and it is wet and very windy. It is an odd time of year to come to the Highlands. I have always wanted to travel the Inverness to Kyle of Lochalsh railway, along with the Mallaig and Wick lines, some of the world’s most scenic railways. Up to end March it is possible to travel anywhere in Scotland on ScotRail for £17 return once you have purchased a £15 Club 50 card. 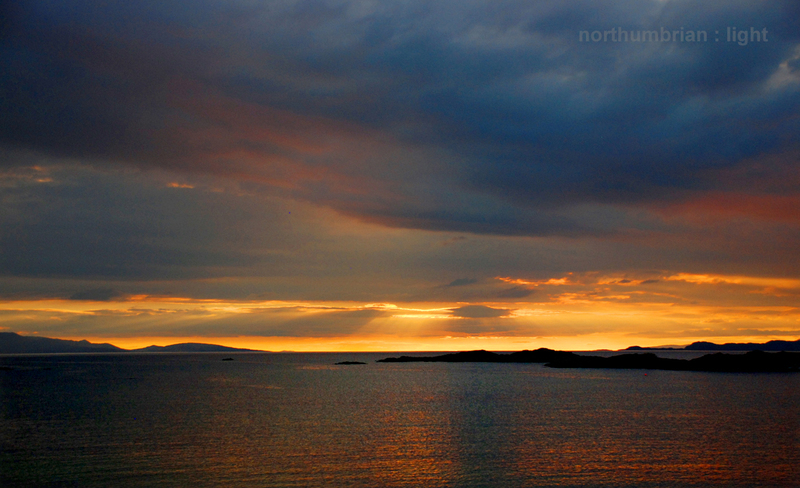 There was one slight flaw to my cunning plan – the journey north from Inverness was in complete darkness. I might as well have been travelling on the London Underground. Nevertheless, the journey south, tomorrow, starts at 12:08 so the landscape will be revealed in all its glory – assuming there is no mist. To fill in time on a damp day, I took the bus from Kyle of Lochalsh to Elgol and Glasnakille, on the west coast of Skye. I was one of three passengers throughout the entire trip. The bus stops at Elgol for tea with the driver, Gordon, and immediately the BBC news comes on the radio at 1pm, we must get back on board and head for Glasnakille. It is timed like an Apollo launch. 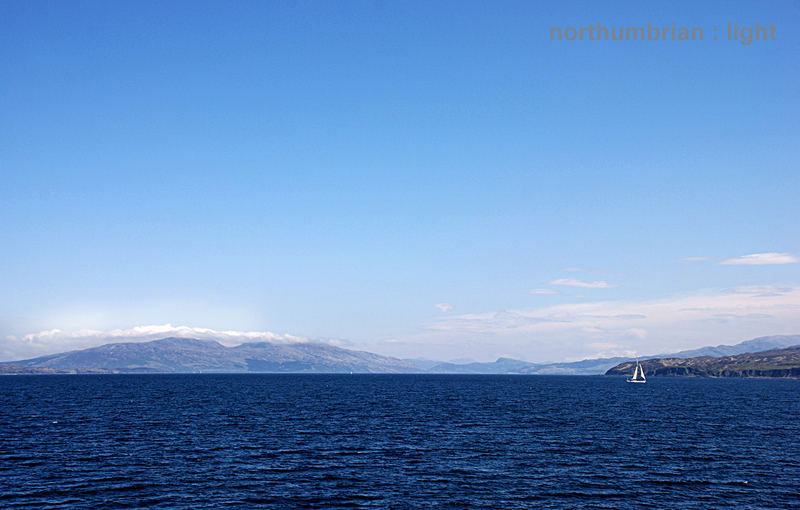 It was at Glasnakille that I was joined by a local lady bound for Broadford – she described it as a ‘course’ day. The conversation flowed from there, covering such diverse topics as Ian Anderson of Jethro Tull who once lived in nearby Strathaird House; the clearances; education – up to eleven there is a local school but thereafter children must board at Portree, the only secondary school on the island; the high volume of traffic in the summer; midges – you just have to out up with them and, the dreaded camper vans. By the time we reached Broadford, I felt like a local. Gordon would be back at 15:22, on the dot, to take her home. Smoking can damage your health. I have always known this. On Boxing Day 1968 I was heading south on the old Derby Ring Road, destination Mallory Park for the annual winter race meeting. I never finished the 180 mile round trip from Altrincham. Distracted by my attempts to light up while at the wheel, I didn’t see the approaching roundabout until it was too late. The only route was straight across the middle. The high kerbs squared off the front wheels of my sky blue Mini (6428 VR), pushed back the subframe and cracked the front windscreen. My pride and limited reserves were severely damaged. I was seventeen and lacking the necessary powers of concentration. Two more lesser incidents the following year finally drilled the message home – keep you mind on your drivin’, keep you hands on the wheel. 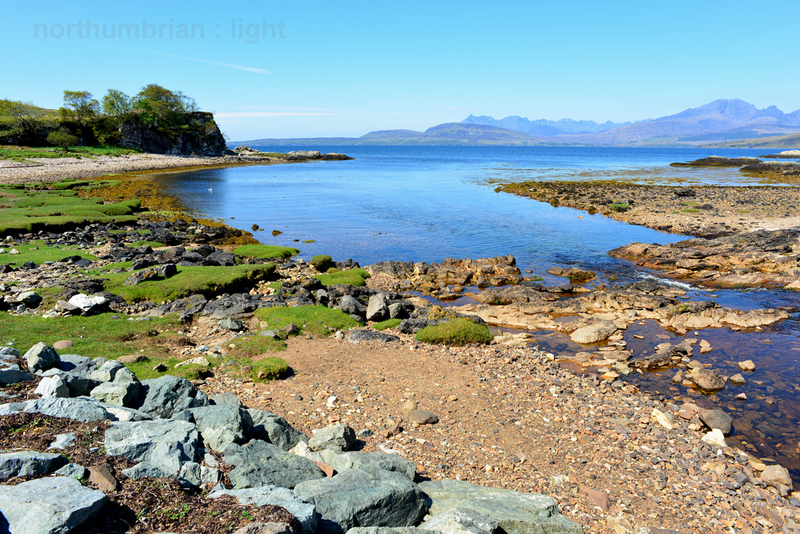 Now, ‘older and wiser’, I think nothing of driving 750 miles over a weekend except the incentive has changed; once it was racing circuits, now it is golf courses and in this instance, Sconser on the Isle of Skye followed by Traigh near Arisaig. The Isle of Skye Golf Club sits next to the sea overlooking Raasay, the island with the haunted bridge and Calum’s Road. 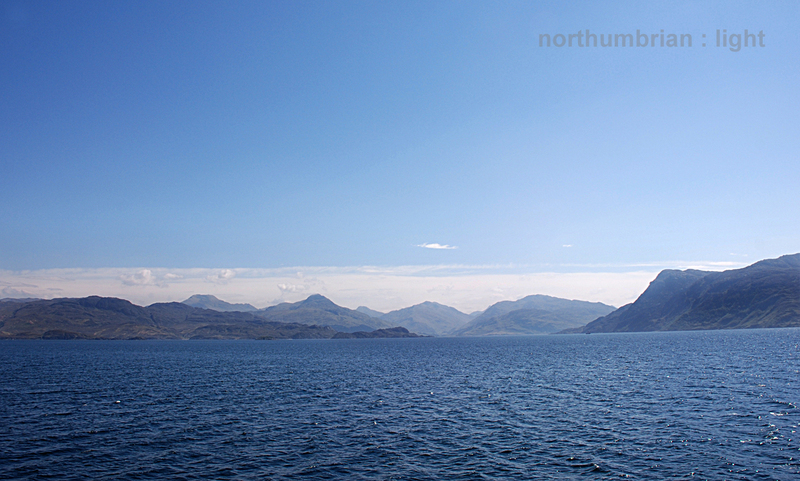 To the north of the course is the Skye to Raasay ferry and at its southern end, Sconser quarry. I like to imagine explosions from the quarry mid backswing and shrapnel peppering the second green. It has all the right ingredients for Golf in the Wild – the friendly but unpretentious clubhouse, empty fairways, well kept greens, mountains and the salty sea air. The occasional midge is a price worth paying. Look up the hill from from the first green and the main road disappears; the clubhouse appears to sit alone in a mountainous landscape, the perfect illusion. The following day’s weather was less mixed, more consistent – rain and wind. Nevertheless, we were determined to enjoy the Traigh Open and in a determined fashion we did. 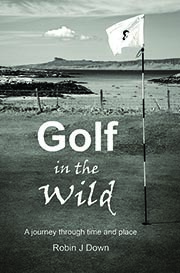 Many thanks to www.scottishgolfbytrain.co.uk for sharing in the highs and lows of Golf in the Wild at Sconser and Traigh. It runneth the earth’s wide regions round. 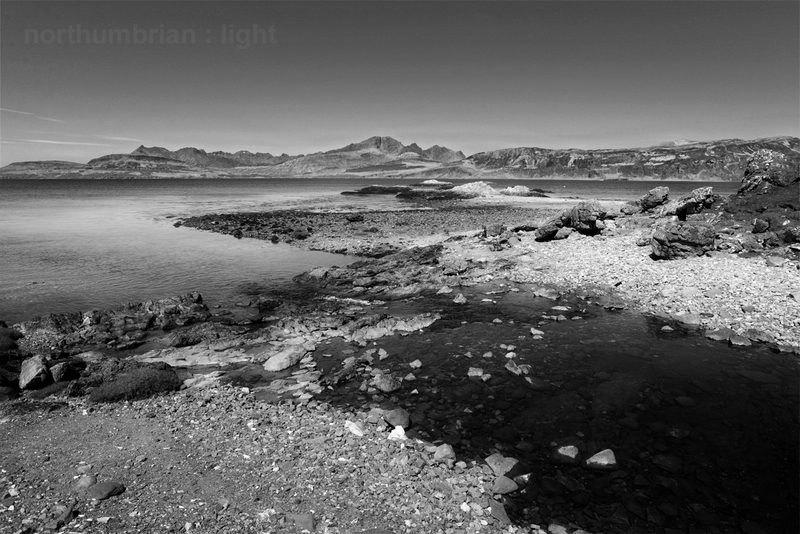 These photographs were taken a few weeks back on the Isle of Skye where the Ord River flows into Loch Eishort. About two miles from the ferry at Armadale there is left turn at Kilbeg which takes you on a single-track detour through Tarskavaig, Tokavaig and Ord eventually re-emerging some 3 miles further north on the same Armadale to Broadford road. These photographs were taken on the beach at Ord, the northernmost point of the diversion. 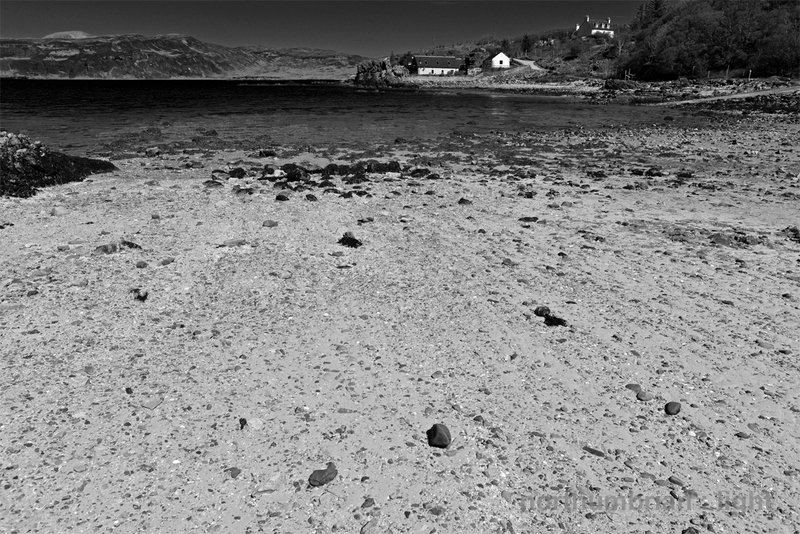 This second image was taken from the same beach looking north towards the small hamlet of Ord. The drag of the tide is such that the pebbles on the beach appear to be flowing towards the sea (click on the images to enlarge).